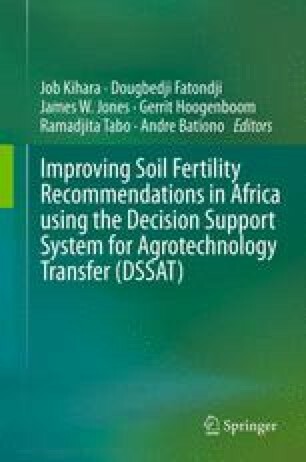 Limited information is available on the potential performance of introduced dual purpose varieties across different Kenyan soils and agro-ecological environments and consistency across sites and seasons. Crop simulation modeling offers an opportunity to explore the potential of and select introduced cultivars for new areas before establishing costly and time-consuming field trials. Dual purpose soybeans were introduced due to their ability to improve soils and at the same time provide substantial grain yields. The objective of this study was to derive genetic coefficients of recently introduced dual purpose soybean varieties and to explore the reliability of the Cropping System Model (CSM)-CROPGRO-Soybean model in simulating phenology and yield of the dual purpose varieties under different environments. Field trials for seven varieties were conducted across three sites in two seasons and data on phenology and management, soil characteristics and weather was collected and used in the CROPGRO model. A stepwise procedure was used in the calibration of the model to derive the genetic coefficients. Two sets of data from Kakamega and Kitale were used in calibration process while 2006 data for Kakamega and Msabaha, were used for evaluation of the model. The derived genetic coefficients provided simulated values of various development and growth parameters that were in good agreement with their corresponding observed values for most parameters. Model evaluation with independent data sets gave similar results. The differences among the cultivars were also expressed through the differences in the derived genetic coefficients. CROPGRO was able to accurately predict growth, phenology and yield. The model predicted the first flowering dates to within 2–3 days of the observed values, the first pod dates within 3 days of the observed values and yields within 5–300 kg ha−1 of the observed yields. The genetic coefficients derived in CROPGRO model can, therefore, be used to predict soybean yield and phenology of the dual purpose soybean varieties across different agro-ecological zones. This research was funded by the TSBF soybean project in collaboration with KEPHIS. We would like to acknowledge the work done by KEPHIS and TSBF staff in ensuring the success of the field trials and this research as a whole. Special thanks to AfNET for sponsoring the DSSAT training and the provision of the software for use.